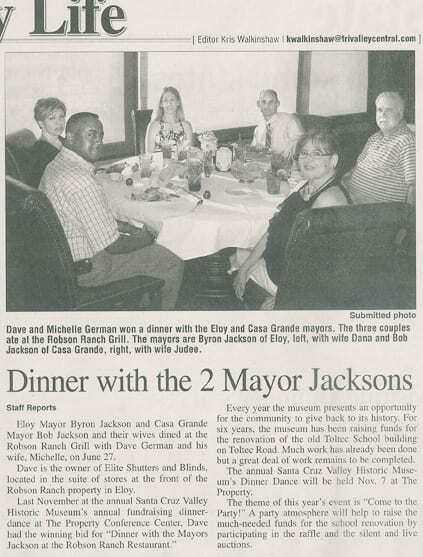 Eloy Mayor Byron Jackson and Casa Grande Mayor Bob Jackson and their wives dined at the Robson Ranch Grill with Dave German and his wife, Michelle, on June 27th. Dave is the owner of Elite Shutters and Blinds, located in the suite of stores at the front of the Robson Ranch property in Eloy. Last November at the annual Santa Cruz Valley Historic Museum's annual fundraising dinner-dance at The Property Conference Center, Dave had the winning bid for the "Dinner with the Mayors Jackson at the Robson Ranch Restaurant". Every year the museum presents an opportunity for the community to give back to its history. For six years, the museum has been raising funds fo the renovation of the old Toltec School building on Toltec Road. Much work has already been done but a great deal of work remains to be completed. The annual Santa Cruz Historic Museum's Dinner Dance will be held Nov 7 at The Property. The theme of this year's event is "Come to the Party!" A party atmosphere will help to raise the much-needed funds for the school renovation by participating in the raffle and the silent and live auctions.